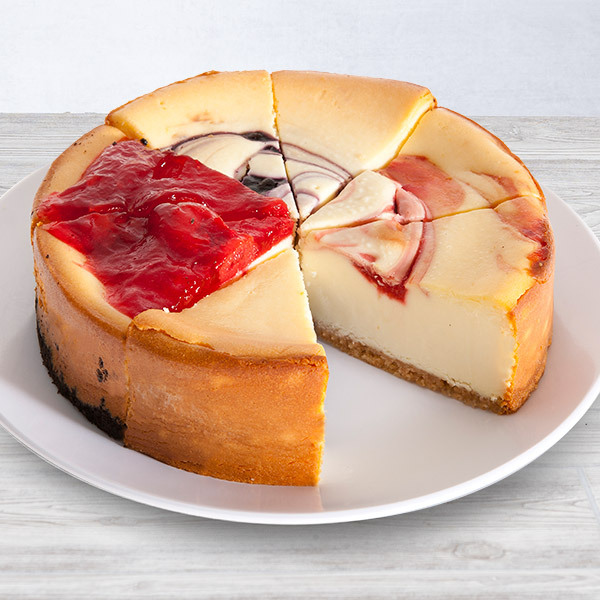 Fruit and cheesecake unite together in perfect harmony in our fruit cheesecake sampler comprised of sweet Strawberry Swirl, Cherry Almond, Lemon Blueberry, and New York cheesecakes. 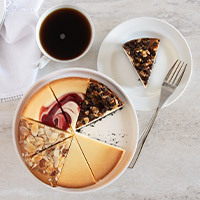 A bite of any of these delicious slices will make you wonder how you ever ate any other desserts. I bought this for my son in the military since he wouldn't be home for Thanksgiving. He said it tasted delicious and liked the variety of flavors. I bought this several weeks ago as a Birthday present for my cousin in Georgia. He was pleased when he finally received it which was a little delayed. However he is quite pleased with the creaminess & quality of the product. I will be ordering again. I bought this small variety cheesecake for my Dad's birthday. It arrived on time and he said it was delicious! It really made gift giving easier when family doesn't live close by. Not all food that is mail delivered is good, but gourmet gift baskets really delivers great quality! 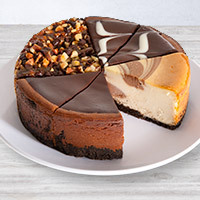 I love my cheesecakes and these were the best I had ever eaten. I love the no crust bake and lots of flavor between the cheese and fruit fillings. Not a lot of fruit fillings but it was what the slices needed. I loved it.